Morceli on the winner's podium at Rieti, 1997, for his 3:31.01 win. From WebRAISport. This site has been updated (July 3, 2005), check it out! Also: I'm always interested in any information on Morceli, if you have info or stories, please email in (tetreaul AT cs.rochester.edu) . Who is Morceli? Simply one of the greatest middle distance runner ever. He has won three World Championships in the 1500m and the 1996 Olympics 1500m. At one point, he held all records from 1500m to 3000m, as well as the indoor 1000 and 1500. This site is devoted to chronicling the Algerian's impressive career. 03 Jul 2005 - Ten years ago today, Noureddine Morceli set the world record for 2,000 meters at the Paris Gaz de France Grand Prix meet with a time of 4 minutes, 47.88 seconds. The previous record was 4:50.81 by Said Aouita. Hicham El Guerrouj of Morocco currently holds the world record in 4:44.79. The athlete Nourredine Morceli announced Tuesday in the City of Chlef that he did not renounce competition and that he will return soon to racing by engaging in the 10,000 m and the marathon. The former world champion of the made this statement at the time of the reception organized by the wali (administation officer) of the city of Chlef in the honor of the representatives of the press, on the occasion of the world day of the freedom of the press. He was present as a guest of the local authorities there. He moreover announced his intention to create a school of athletics in the area where he was born and where he embraced a top level career. It should be noted that Morceli currently accomplishes a stay with his family in Ténès, Sidi Akkacha, at 50 km in the north of Chlef. Seizing the opportunity of his presence among the journalists and correspondents, He made a point of paying homage to the journalist corporation for the significant role that it plays in the development of the country, and in particular in the sport field. 17 Feb 2005 - Collegiate times for Morceli can be found at Riverside CC's Track All-Time lists. Morceli can be found in events between 800 and 5000m. 01 Feb 2005 - Found these pictures of Morceli signing autographs at an astrophysics observatory in Algeria. 1 May 2003 - Delayed news: Morceli was supposed to compete in the Algerian National Cross Country Championships on March 7 in Algiers but did not. Thanks to H. Laroussi for the information. 12 Sep - good little bio on Morceli in French: here. 23 Jul - Morceli season progressions updated. 20 Jul - Morceli DNF's at Monaco in the 1500m while Rui Silva of Portugal goes on to win in 3:30.36. 18 Jul - Morceli listed on the startlist for the 1500m at the Monaco Golden League meet (this Friday). Morceli's last race was the semi-final in Sydney where he declared he would no longer run the 1500m and move up to the 5000m instead. The favorite in the race is Bernard Lagat of Kenya, bronze medalist at Sydney. 20 Jun - Heir to Morceli's throne, Algerian Ali Saidi-Sief took down Morceli's national record in the 2000m, running 4:46.88 in Strasbourg, France to eclipse Morceli's then WR of 4:47.88. Saidi-Sief, silver medalist in the 5000m at Sydney, went through the kilo in 2:23.77, the 1500 in 3:35.5 and finished 17 seconds of the nearest competitor. For more information click here. 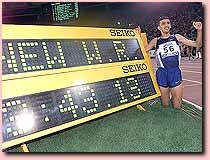 27 May 2001 - El Guerrouj ran the fastest outdoor mile in the US ever: 3:49.92 at the Prefontaine Classic in Eugene, Oregon today. The previous record belonged to Morceli in the Atlanta GP in 1996 (3:50.86). Go here. 27 Sep - in the semis, Morceli got bumped and thrown off stride. Out of the race with 80m to go, he jogged it in. Afterwards he declared that this was his last 1500m ever and next year he is definitely moving up to the 5000m. Go to 2000 Season Reports for more information. "This is my first race in a year. I have had seven weeks of good training, which has given me the confidence to compete today. I had sickness in my stomach, and this season a hamstring injury which has prevented me from competing. There was a lot of pushing in the race today. Anyone can win the final." 11 September 2000 - Sydney - Algeria's 1500 metres Olympic champion Noureddine Morceli will make a surprise defence of his title it was revealed by a member of the Algerian delegation here on Monday. The 30-year-old, who held the 1500m world record until his great rival Morocco's Hicham El Guerrouj smashed it by over a second in July 1998, has not raced since he fell at the World Championships in Seville last year. The three-time world champion, who is scheduled to arrive in Sydney on Saturday, was meant to have run at the IAAF Grand Prix meeting in the Italian town of Rieti over a week ago but pulled out. Morceli has performed disappointingly since his bid to win a fourth successive world title in 1997 was overshadowed by the death of a brother days before the first round heats - he was to finish fourth behind his nemesis El Guerrouj. The first round of the 1500m is on Monday September 25. 14 Jun - an article with Morceli on his switch to the 5000m. 8 Jun - has Morceli retired or not? After his DNF at Seville (his last race) it appeared that the great miler might call it a career. An article in the Algerian newspaper "Le Matin" following the Seville race suggested that Morceli may have retired. However, Morceli was spotted at the University of New Mexico (USA) track doing a workout, so he may be back for the Sydney Olympics. 21 Mar - Morceli is among one of 44 athletes up for election to eight spots on the International Olympic Committee. Go to: IAAF web site for more information. Other top contenders include Gabriella Szabo, Sergei Bubka and Stefka Kostadinova. 7 Feb 2000 - Denmark's 800m star, Wilson Kipketer snapped Morceli's remaining world record, the indoor 1000m, by one one hundredth of a second: 2:15.25. Kipketer's performance in Stuttgart eclipsed Morceli's 1992 mark of 2:15.26. 8 Sep - El Guerrouj snatched Morceli's remaining outdoor world record last night in Berlin. Running cool temperatures, the Moroccan's 4:44.79 pummeled Morceli's 4:47.88 2000m set in Paris July 3, 1995. Remarks from Seville are coming soon. 16 Aug - I'm going to Seville to watch the world championships and Morceli, so this site won't be updated until I get back, September 2. Go to the IAAF web site for results. In the meantime, visit the Statistics section for a lot of the results, splits, have been updated. There are also a ton of 1991 season reports and pictures for your perusing pleasure. The finals of the 1500m go off the night of August 24. 8 Aug - Morceli decided not to race at Cologne. The race was won by France's Driss Maazouzi in 3:38.20. Look for Morceli at the Zurich Weltklasse meet on the 11th. 6 Aug - three days after his 3rd place in Monaco, Morceli will be running the 1500m again in Cologne. Notable competition will come from Benjamin Kipkirui. After the Sunday race, Morceli will travel to Zurich to race against Komen, El Guerrouj, and Ngeny, among others, on the 11th. This Saturday, El Guerrouj is returning to London to lower his mile world record. 4 Aug - Morceli turned in another sub 3:31 time to take third at the Herculis Zepter meeting in Monaco tonight. Noah Ngeny won in 3:29.79 with Kenyan US-collegiate Bernard Lagat nipping Morceli in the final meters with a 3:30.61. 28 Jul - 3:32.65 was Morceli's winning time at the Venizeleia International Meeting on the island of Crete tonight. Benson Koech of Kenya was 0.55 behind. 23 Jul - this just in: a very good article on Noah Ngeny and Noureddine Morceli from the International Herald Tribune. The report details Morceli's car accident and his bid to return to form. inactivity," said Morceli. "I wanted to test my level against that of Ngeny. still a lot to do." 11 Jul - Morceli opens up the season with a 2:18.10 victory over 1000m at Ingolstadt, Germany. Morceli spent some of the spring training at his altitude camp near Mexico City. Click here for report. (thanks to Stephane Franke and Marco Velediaz for the above information). 7 Jul - El Guerrouj broke Morceli's 6 year old Mile WR by running 3:43.13 in Rome tonight. He was not alone as Kenyan's Noah Ngeny also went under the old standard of 3:44.39 with his 3:43.40. Golden Gala Results. 17 Jun - new season reports section that has all press releases, interviews, articles, on Morceli in one place in this site. 16 Jun - Morceli seems to be keeping a low profile this season. He hasn't raced yet even though it is one month into the European track season. The latest he has ever opened up a season was June 21 back in 1991....El Guerrouj has already run 3:31 and 3:32 and young Kenyan Noah Ngeny has two 3:31's and the WL to his credit so far. 19 March 99 - according to the IAAF Morceli will be competing in the short course World Cross Country Championships this weekend in Belfast. The last time he was at the World Cross Champs was ten years ago where he finished 26th. He finished 9th the previous year (both were the junior race). The IAAF has a detailed report here: here. Last year's headlines and quips have been moved to: mor1998.html.